Ugh, another hard-to-see page. 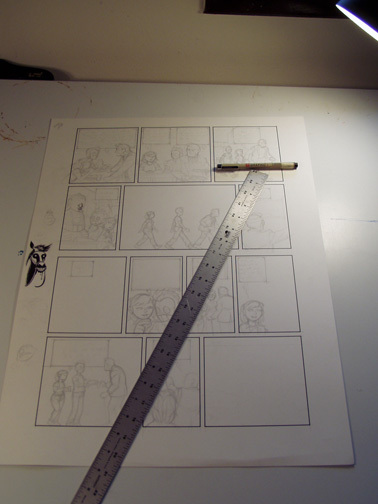 It doesn’t help that I draw with an extremely light 4H pencil, either. 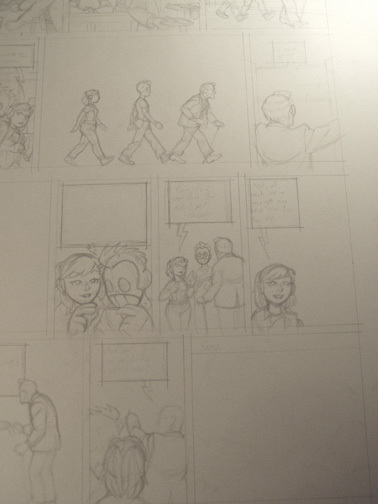 Before I start drawing anything, I pencil in the lettering, so I know basically how much space it’s going to take up. I don’t want to draw something and then have to erase it to fit in the lettering. That’d be a waste of time. so I rough in the letters and balloons first. Then I just start to draw in whatever panel strikes my fancy. You can see I’ve jumped around a lot here. The first panel is finished, the second panel is partly done, the third panel hasn’t been started, but a whole bunch of others are also in various stages of finish. I’ve also drawn a creepy horse in the margin. I tend to doodle a lot on the margins. 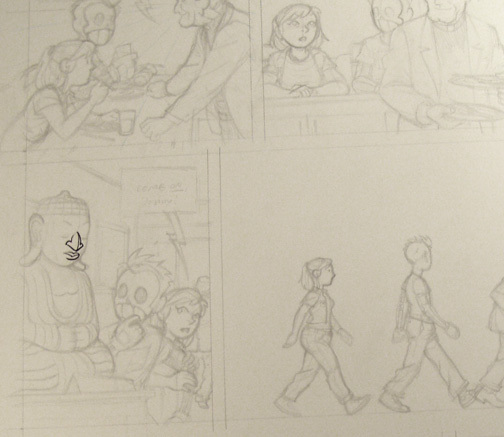 After I pencilled this panel, I felt like inking the nose on the Buddha. So I did. Have I no method to my madness? No! 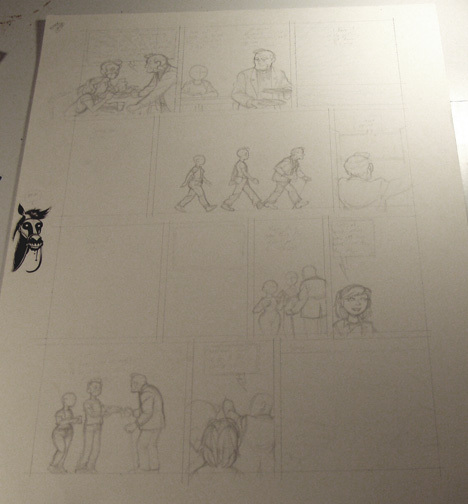 When I feel like I want to start inking whole panels, it’s time to get the word balloons inked in first. I start by drawing square-cornered boxes with a t-square. Then I freehand in curves at the corners. The creepy horse has been joined by a worried-looking Bert. I tend to draw Bert a lot. I don’t know why. Once the balloons are all pencilled and I can see whether any of them are going to break the panel borders, I can ink in the panel borders. 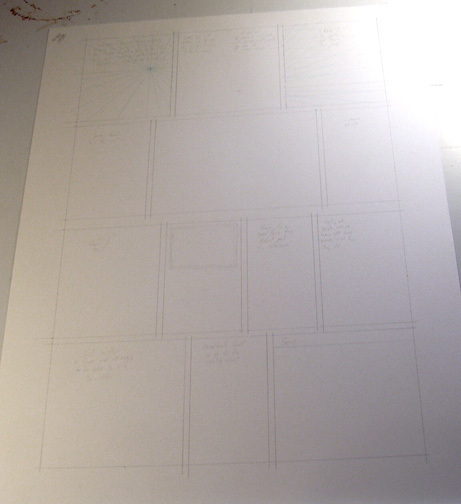 On this page, none of them broke the panels, so I didn’t have to worry about it. Whenever someone off-panel speaks, though, I have the balloon tail extend over the border. 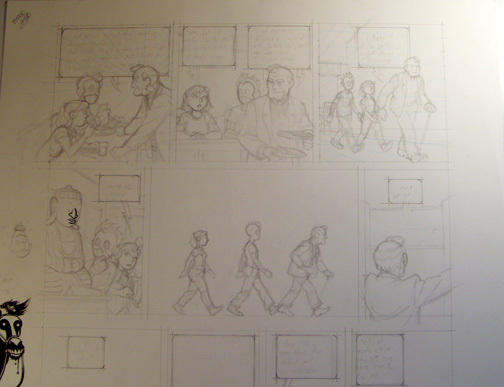 I inked in the panels with a Pigma Graphic 1.